The Nindendo Wii (pronounced "wee") has a very unfortunate name doesn't it? :D.
Anyway I love pulling apart stuff, so of course I'm always interested to see the latest photos when something new that has come to market has been pulled apart. Informit has an entire article on the dismanteling of the Wii. I don't buy game consoles; personally I think if you have a computer there's no point getting a butchered computer that doesn't have a keyboard, has to be hacked just to run normal software and is far slower and [mostly] not upgradable! 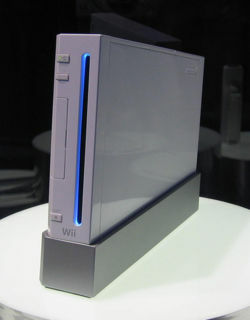 However if I were to ever changed my mind, I would be getting the Wii over the PS3 or the Xbox 360. It looks sweeeeeet. I just wouldn't tell anyone in Australia or the UK the name of it ;). Older post → Apple I With Aftermarket Wooden Case!